Director – Edwin L. Marin, Screenplay – Curtis Siodmak, Photography (b&w) – Les White, Music Director – H.J. Salter, Special Photographic Effects – John P. Fulton, Art Direction – Jack Otterson. Production Company – Universal/Frank Lloyd Productions Inc. In New York City, printer Frank Raymond is approached by Nazi officer Conrad Stauffer and Japanese agent Baron Ikito. They are aware that Raymond is the grandson of Frank Griffin, The Invisible Man, and are prepared to torture to get the secrets of the invisibility formula from him. Raymond refuses and makes an escape. He refuses also to give the formula to the US State Department but changes his mind after the Japanese bombing of Pearl Harbor. He agrees only on the condition that he be the one to take the formula. He is parachuted in to Berlin, taking the formula just before he lands. He gets in touch with a contact and is led to the lovely Maria Sorenson. However, Stauffer gets wind of an invisible man and sets a trap to capture Raymond. Despite this, Raymond sets out to sneak in and obtain the plans for the Nazi invasion of the US and then make an escape back to safety. Universal’s Invisible Man series is not as well remembered today as their Frankenstein, Dracula and Wolf Man films were. Nevertheless, throughout the 1940s, they churned out a popular series of sequels following on from James Whale’s The Invisible Man (1933), which had been adapted from the H.G. Wells novel. 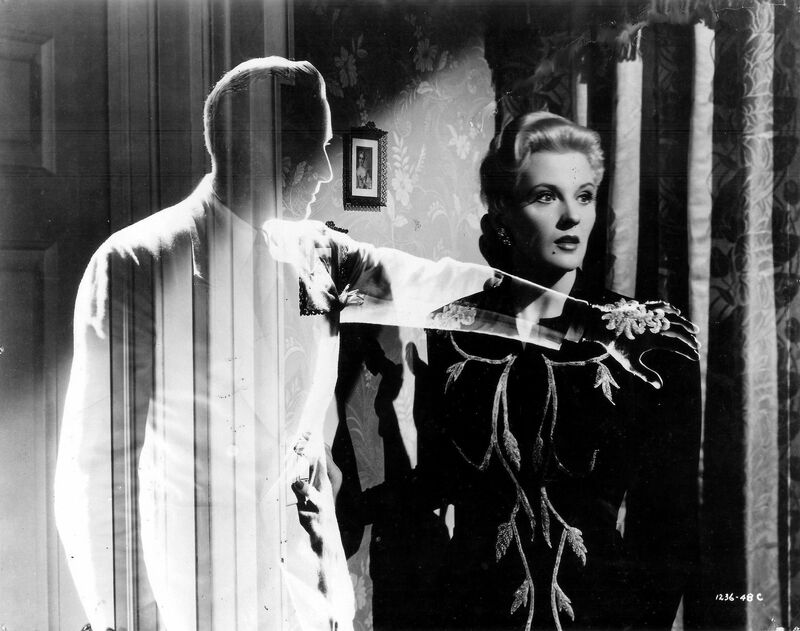 The sequels consisted of The Invisible Man Returns (1940), The Invisible Woman (1940), this and The Invisible Man’s Revenge (1944), before the series ended with the inevitable meeting up with Abbott and Costello – The Invisible Man has a minor appearance at the end of Abbott and Costello Meet Frankenstein (1948) and then gets a film all to himself in Abbott and Costello Meet the Invisible Man (1951). 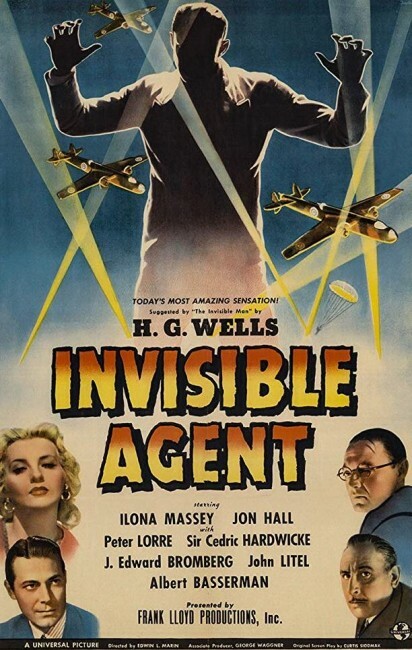 Invisible Agent was made seven months after the bombing of Pearl Habor and the American entry into World War II. Thus the invisible man capers of the previous films have now been rewritten with a patriotic bent. Following a montage of scenes depicting the outbreak of war, The Invisible Man immediately offers his assistance to the State Department. The villains of the show are the ever-dependable Nazis and the Japanese with Peter Lorre outfitted in round glasses like a cartoon caricature of the Japanese from the era. (Lorre, who was in actuality an expatriate German actor, gives a performance that manages to steal much of the film). Invisible Agent is a marked improvement over the previous entry The Invisible Woman, which was almost completely played for laughs and is the series low point. Not that that the comedy element doesn’t feature here. There are wacky images such as Jon Hall taking the serum on the plane and stripping his clothes off while parachuting down and observers on the ground seeing an empty parachute land. 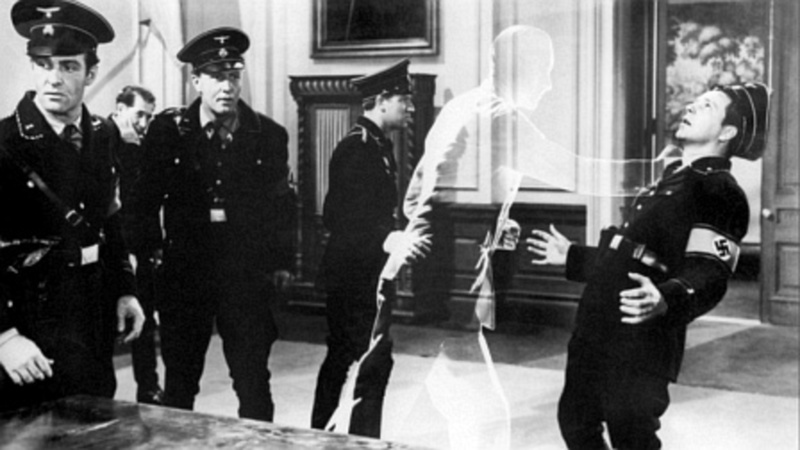 There is also an eminently silly scene at Ilona Massey’s house as J. Edward Bromberg’s pompous Nazi official arrives with dinner, which involves the invisible Hall making fun of Bromberg, spilling food on him, taking his chicken leg and finally tipping the table over him. On the other hand, these sit alongside some imaginative and well-staged scenes. Like where Sir Cedric Hardwicke’s Nazi official sets a trap and lures Jon Hall to his office and keeps him there at gunpoint, insisting he sway in the chair so he can be sure where he is, before Hall sets a wastepaper basket on fire and soon has the whole room alight where he causes merry chaos as the soldiers outside rush in to capture him, before escaping out the window and down the ladder the fire department bring up the outside of the building. There is another great scene where Hall sneaks into J. Edward Bromberg’s cell and torments him, before knocking two guards out and making an escape dressed in an SS officer’s uniform with the collar turned up and cap pulled down, followed by a great extended climax getting away on a plane, dropping bombs on the Nazi invasion airfield and finally being forced to jump out of the plane after it is shot down over England. Director Edwin L. Marin was a steady director of Westerns and comedies throughout the 1930s and 40s. His only other venture into genre material with the Reginald Owen starring version of A Christmas Carol (1938). Screenwriter Curtis (or usually Curt) Siodmak was a German native who had worked as a novelist and began writing scripts in Germany with the science-fiction film F.P.1 Does Not Answer (1932), before fleeing to the US with the rise of the Nazis. His genre scripts include Trans-Atlantic Tunnel (1935), The Ape (1940), Black Friday (1940), The Invisible Man Returns (1940), The Invisible Woman (1940), The Wolf Man (1941), Frankenstein Meets the Wolf Man (1943), I Walked with a Zombie (1943), Son of Dracula (1943), The Climax (1944), House of Frankenstein (1944), The Beast with Five Fingers (1946), Tarzan’s Magic Fountain (1949), Riders to the Stars (1954), Creature with the Atom Brain (1955) and Earth Vs the Flying Saucers (1956). He also directed/wrote several films with Bride of the Gorilla (1951), The Magnetic Monster (1953), Curucu, Beast of the Amazon (1956) and Love Slaves of the Amazon (1957). Siodmak also wrote the classic novel Donovan’s Brain (1942) about a millionaire’s disembodied brain that ends up mentally controlling the scientist that removed it, which has been thrice filmed as The Lady and the Monster (1944), Donovan’s Brain (1953) and Vengeance/The Brain (1962). Siodmak’s lesser known follow-up Hauser’s Memory (1968) about transplanted memories was also filmed as the tv movie Hauser’s Memory (1970).